Our Universal "Combo" Game Case solves your game rental and library storage needs. The versatile case will accommodate : Nintendo 64, Super NES, Sega Genesis, Electronic Arts, cd formats with and without jewel case. 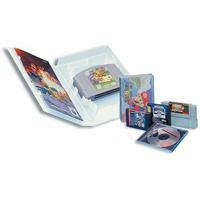 Case includes guidelines for easy insertion and positioning of games. Universal "Combo" Game case will accommodate most instruction booklets and has a full out sleeve to insert your own artwork. Universal game cases are the solution you've been looking for to store your retro game collection. Cases feature an outer sleeve allowing you to create your own artwork for each game so that you can attractively display them on your shelves. These cases will accommodate Nintendo 64, Super Nintendo, Sega Genesis, Electronic Arts, and cd games (with & without jewel cases), as well as most instruction manuals.